Great piece of furniture!! Not complicated to assemble and very sturdy. Fits perfectly in the space I got it for. Excellent quality. Definitely would recommend this bed. Put your mind at ease with the eco-friendly design of this Shaker platform bed. This bed features a pinewood build, ensuring stability, and three support legs and a platform style give you the flexibility of using a box spring or just a mattress. This wood panel, queen size bed comes in several finishes to match any room. Dimensions 86.0 In. X 64.0 In. X 50.0 In. The bed arrived in two boxes. 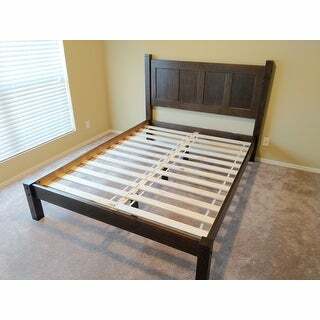 I am over 50, but could bring in the boxes and assembled this queen bed by myself with a screwdriver. I did it in two stages - headboard, footboard and centerpiece on one day, and put it all together the 2nd day. The bed is very sturdy, and looks great. The bed delivered on time, easy to assemble with 2 person. My husband and I spent approximately 90 minutes from start to finish assembling the bed and it came out really nice. It's sturdy and the quality seems good! I bought it for my guest bedroom and will update the durability once it has been used. I really do love this bed, the only thing I recommend is not rely on it as a platform bed, because a platform Bed does not need a box spring. 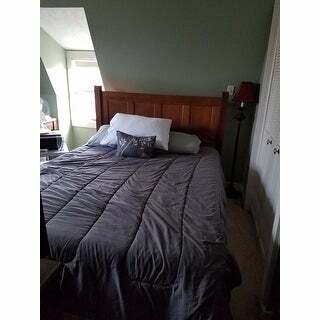 This bed needs a topper or a box spring so that your pillows do not fall through the gap between the backboard and the mattress its at least 4 inches wide and can be and issue, otherwise solid bed and it looks great. Sturdy bed for a great price. When the bed first arrived it came with the wrong parts. I had ordered the walnut bed, but the rails came in espresso. I called customer service and they took care of it right away. The correct parts arrived 4 days later. The bed is made solid wood and the box with the rails is very heavy. However I'm a 40 something women with a bad back and I was able to put the bed together in a little under an hour. The directions are fairly simple and easy to follow. All the parts, tools and hardware are labeled and bagged separately. The only part I needed help with was securing the screws for the slats. My husband used his battery drill for this....everything else I used the Allen key that came with it. We purchased a foam bed from *** for this frame and I have to say this bed is pefect! Its for my 17 year old son and he loves it!! I would and have recommended this bed to friends and family. First of all, the online pictures of walnut and cherry are not accurate. I ordered Walnut and the color is medium tone, the option cherry is even darker than walnut. The online picture shows cherry as a light color which is wrong. 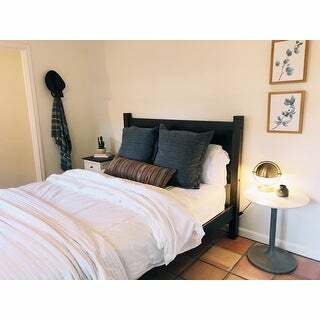 The bed is made with solid wood, however, I was surprised how thin the head board panel and the slats are, especially the middle beam that supports the slats, feels like it could snap in half anytime. 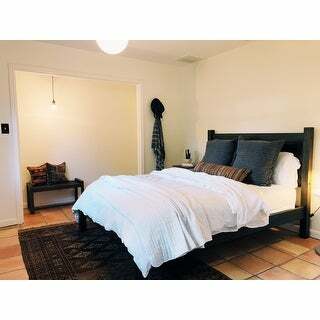 It has no comparison to my old bed which is made with thick solid wood, and that bed last 13 years and 6 moves. This bed arrived with some long scratch on the headboard, luckily it's on the backside. Free Fedex delivery but they only dropped the packages off at building entrance. I had to carry them to my second floor apartment by myself (no elevator). Instructions aren't the best. For example it tells you to attach the two side columns to the headboard first, but then you won't be able to fit the horizontal support piece in between the two columns. Supposed to attach one column, add the horizontal support piece and then add another column. Well packaged and easy to put together. Solid wood frame is beautiful in walnut finish. Shipped in two packages, as compact as can get. 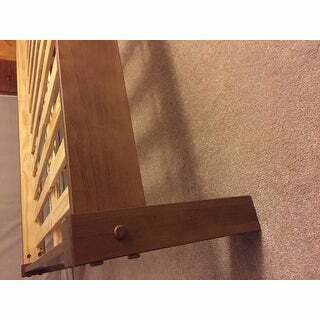 Bedframe is sturdy and platform slats are great! I purchased this for a guest bedroom. I also got matching nightstands. The quality for the price is fantastic. The bed took my husband less than hour to put together, not too bad. The bed looks very nice in its space. As a note , it does come with wooden slates and technically wouldn’t require a box spring. However , the mattress we have in there is on the slim side and therefore a little low to ground and it also leaves gap in headboard. We will be getting a box spring in future to accommodate. If your mattress is thicker should be fine. Either way , we are still happy with our purchase. This bed comes in two boxes. It was well packed and arrived quickly (shipped from close to home) with no damage. Assembly took quite a bit of time, lots of hardware and steps. I put together another queen bed after this one that had many fewer steps which was appreciated. However, it was not difficult and the end product is nice (though I could live without all the wood caps). 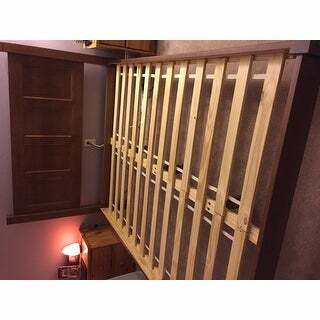 This bed comes with roll slats which would be compatible with mattress only though we are using a boxspring. Pleased with purchase so far. This items is of better quality than I expected. I am a 65 year old (young!) female, bookkeeper by trade, and I was able to assemble this by myself. It is sturdy and square and quite attractive. I advise putting felts or other sliders on the bottoms of the posts before you get started, so you can push it around as necessary. I did need a power drill to screw the slats to the rails; otherwise, it went together quite well. Good, solid hardwood, reasonably nice finish where finished (e.g. back of headboard and inside of side rails not finished. easy to put together IF YOU HAVE A COUPLE OF PEOPLE TO HOLD THINGS IN PLACE. Don't try to do this by yourself! All in all, if was a good quality piece at a good price, and I'm glad I purchased it. Have had this bed for a year now. It has held up well to kids and a dog jumping on it. Fairly easy assembly. I love the look too! Simple and classic. Good quality bed. Very sturdy. Looks nice. Came well packed with no missing hardware. Was easily assembled by me alone. Only issue is the color is WAY darker than the cherry shown online. The boxes were marked Cherry, which is what I wanted, but what was in the boxes was Walnut. Deducted one star for that issue. I can live with that, but beware that if you order Cherry you may be disappointed with how dark it is. See photo. Was extremely happy with the quality of this bed! Waaayyy more than you'd expect from the price. This piece will last for years. Very nice, rich cherry finish and very sturdy. The assembly took my husband and I about 45 minutes and went very smoothly due to everything being clearly labeled and the instructions were great. It’s not easy to find a bed for this kind of a price that’s solid wood. For comparison, ikea only has one! The bed is nice and coordinates well with the other pieces in the collection. Nice bed. Wood is pretty. I got the walnut. This bed is exactly what I was looking for--a camp/mission style bed that would fit in our southwestern/bohemian decor. It's sturdy and looks great, I only wished it was also available in a king size! 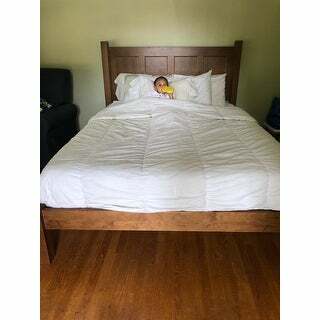 I bought this bed for my son. He loves it! This is a very sturdy and pretty bed. It is well worth the price. Had a change to our bedroom and ordered this bed in Queen size. Like the look. It was a bit to put together ( aprox 2 hours) by experienced helper, but we'll pleased with the result! Would recommend! easy to assemble and looks great! 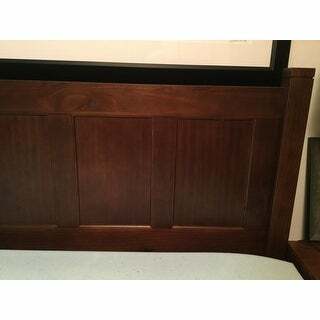 Nice cherry wood grain head board. It has real solid wood witch makes it very sturdy. I think it has a very inviting look. This is a bed that I would Recommend to ALL. We were looking for a simple bed made out of wood. The bed arrived with easy to assemble parts. So far we are very impressed with it. We like the wooden look and the finish is also pretty good! I love this bed! the quality is above what I had expected for the price. The product was packaged nicely to protect the wood. It's a nice solid bed that will last a long time! "Does this bed make noise when you toss and turn when sleeping on it? I was told slats can do that so I am curious, thanks!" It will only make any noises if not properly assembled or if the screws are not well tighten . "Do I have to use a box spring"
No, this bed does not require a box spring. "How much weight does this bed support? I have heard of platform beds breaking because of improper support. Does the center support run the entire length of the bed? Do the slats just sit on an edge or do they actually attach to the side rails? " "Where can I purchase the matching nightstand to this Espresso bed, which is displayed in the picture?" "what is the dimensions of the inside of the bed frame"
"How much does this bed weigh? Like if it comes in a box(es), how much does the box(es) weigh? I need this information for shipping (after it is delivered to me) purposes." "1) What is the distance between the top of the slats & the top of the side rail, ie, how far down does the mattress sit? 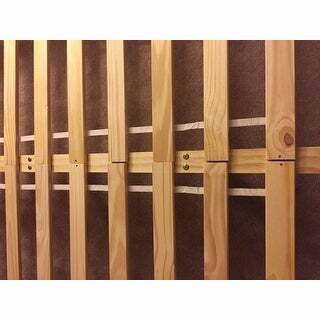 2) What is the measurement between the top of the slats & the bottom edge of the headboard? Trying to determine if my 11" memory foam mattress will be too short & not cover the gap below the headboard. Thanks!" 1) 2.75" 2) 11" So yes, your 11" mattress should just reach the bottom of the headboard.